In relation to the recent ODBC to Oracle problem we've been having (/2007/08/high-number-of-db-connections-to-oracle.html), I wanted to make you aware that enabling ODBC Tracing on your web server will cripple the performance of that server. I needed to reboot after doing this to start the trace log file. Once the box came back up, I tested a page that had a dynamic connection to our database. As opposed to the usual 2 seconds, the response took about 90 seconds to complete! So BE VERY CAREFUL when using ODBC tracing, as it will kill performance on your web server. 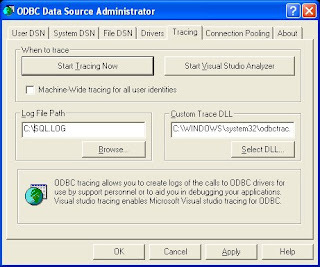 If you absolutely have to have tracing on, run it from only one of the web servers in your farm and only for a short time..hopefully, only during the duration of the ODBC problem you are experiencing. live and learn, as always!